Choose the right play area. Not all playgrounds are safe for children of a certain age, so make sure to choose an age-appropriate play area. For babies and toddlers who are just learning to walk, select a play area with an easy and smooth surface to walk on. Check if the play area uses age-appropriate playground equipment. Tip: Ask if they are using EnviroFluff Cushions. EnviroFluff Cushions are state-of-the-art cushion base material for playgrounds that offer critical fall height (CFH) protection. Moreover, it doesn't contain any harmful chemicals making it safe for both children and the environment. Supervise children as they use playground equipment. Give your child the freedom and space to use the playground equipment, however, don't forget to monitor them as well. Check for any playground hazards, such as broken and rusted equipment, as well as dangerous surfaces. Dress appropriately. For instance, if you are headed to the pool, make sure to wear appropriate swimming attire and never forget your sunblock! If you are headed to a playground, remove necklaces, scarves, or clothes with drawstrings since these are strangulation hazards. Actively supervise them as they play around. Also, make sure to teach your child that shoving or pushing while on the playground can be dangerous. Tip: Headed to an aquatic play area? Ask if they use Water Flecks system. Water Flecks system is a seamless safety rubber system that can reduce the risk of slips and injury. It has a non-skid property when wet, making it an ideal surface for wet play areas. Confirm if the playground is inspected and maintained by qualified personnel. Before taking your child to any play area - be it a pool, an aquatic area, or a playground - make sure that it is well-maintained, cleaned, and child-friendly. 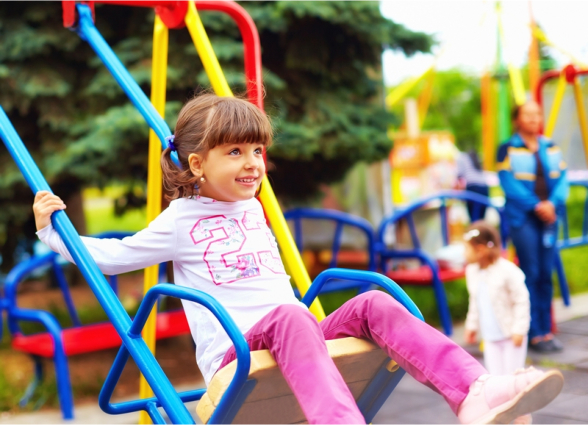 Double-check if they have age-appropriate, well-maintained playground equipment. If you find any hazards, report them immediately and don't let your child use the equipment until it is deemed safe. As much as possible, choose playgrounds with soft surfacing materials and well-maintained equipment. Remember these tips and keep your child safe as they play!